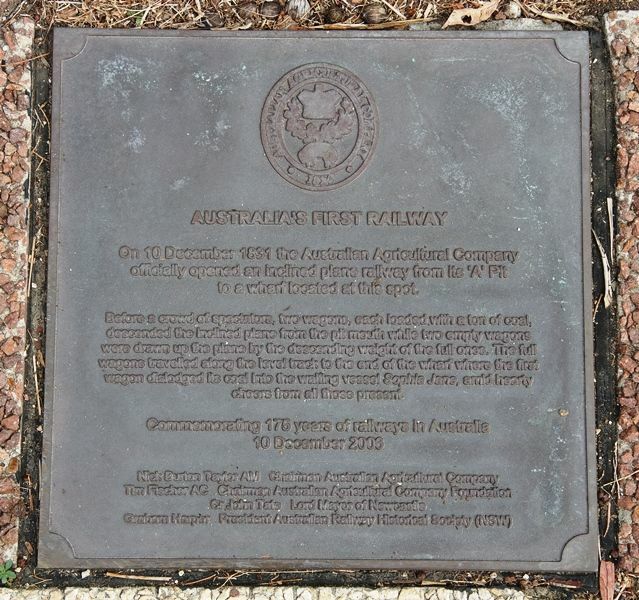 The Lord Mayor of Newcastle Councillor John Tate unveiled a plaque in 2006 donated by the Australian Agricultural Company, to commemorate the opening of the first railway on 10 December 1831 and commemorate 175 years of railway in Australia. 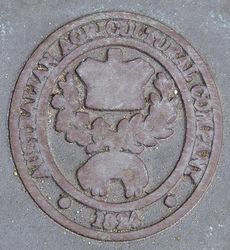 New South Wales' railways date from the 10 December 1831 when the Australian Agricultural Company officially opened Australia's first railway, located at the intersection of Brown & Church Streets, Newcastle. Privately owned and operated to service the A Pit coal mine, it was a cast iron fishbelly rail on an inclined plane as a gravitational railway. 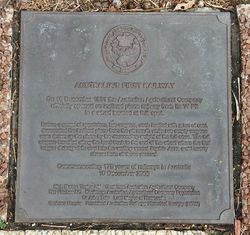 The Australian Agricultural Company (founded 1824), had agreed to take over coal mining at the settlement of Newcastle, from the convict miners that had commenced Australia's first mines in 1804. The company's first mine, known as the 'A' Pit was located on 'the hill'. A railway using iron rails from England was constructed commencing at the pit, down the hill to a coal-loading 'staithe' at the river. One ton wagons of coal were rolled down the railway, connected by rope to empty wagons at the wharf, which were pulled up the slope as the loaded wagons descended. No physical evidence remains of the location of Australia's first railway. 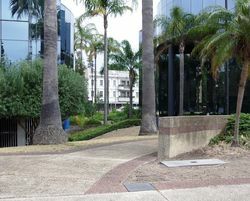 On 10 December 1831 the Australian Agricultural Company officially opened an inclined plane railway from its 'A' pit to a wharf located at this spot. Before a crowd of spectators, two wagons, each loaded with a ton of coal, descended the inclined plane from the pit mouth while two empty wagons were drawn up the plane by the descending weight of the full ones. The full wagons travelled along the level track to the end of the wharf where the first wagon dislodged its coal into the waiting vessel Sophia Jane, amid hearty cheers from all present.